The RGB image of the BIG group. Blue is Halpha Net band, Red is r' band and Green is Halpha on band. 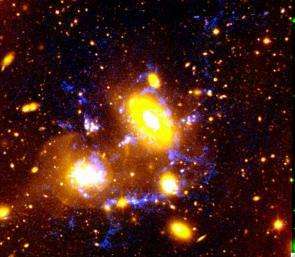 A new image of the centre of a cluster of galaxies has revealed massive filamentary structures that give a rare insight into the evolution of galaxy clusters. “The star forming regions in the cluster that we’d observed previously were just the tip of the iceberg. We’ve now observed filaments of gas streaming out from these regions that are approximately 490 thousand light years across. The gaseous trails mark the path of galaxies travelling at high speed through the cluster. The origin of these unique features is still a matter for debate, but we think the combined action of tidal forces among galaxies in the cluster and of ram-pressure by the ambient medium caused the galaxies to fragment and blast out the ionized gas,” said Dr Luca Cortese, who is presenting the results at the Royal Astronomical Society’s National Astronomy Meeting on 5th April. An international team, lead by Dr Cortese, studied the physical properties of a compact group that is falling towards the centre of a cluster of galaxies known as Abell1367 at a rate of 1700 km/s. The group, which was discovered in 2002, has the highest density of star forming objects ever observed in local clusters. It contains two giant galaxies, at least ten dwarf galaxies or extragalactic clouds of gas and over a billion solar masses of diffuse gas filaments. The results suggest that at least part of the changes to the structure of cluster galaxies that took place in earlier epochs happened very differently to ones observed in today’s clusters. In today’s clusters of galaxies, the galaxies are travelling faster than in the infalling groups, which means that gravitational interactions between galaxies happen much faster. The study was carried out using the Italian National Telescope Galileo in La Palma in April 2004 and February 2006. The results of this study are accepted for publication on Astronomy and Astrophysics.